Huge influx of Fans from Kadapa, Warangal, Pottisriramulu, Nellore districts to Hyderabad. At Image Gardens, Chiru met fans from Kadapa, Warangal, Pottisriramulu, Nellore districts. Talking to huge influx of people and leaders from Kadapa, Warangal, Pottisriramulu, Nellore districts Chiranjeevi said that he will make Andhra Pradesh state No 1 in country in development. He said that he will take it as a elder son of AP all the development activities on to his shoulders in making AP state no1. He said that change is inevitable and that every one should act like a an important tool in building a better society. 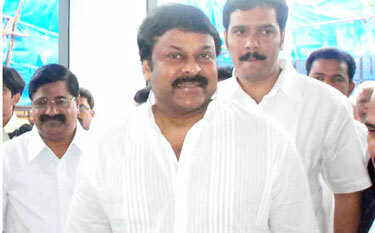 Chiru said that he will give maximum importance in party activities to youth. At J.hills office too, many leaders were seen. Ex MLA Amruta Kumari ( from Srikakulam), Nellore Congress leaders Kotam Reddy, Vinay Kumar Reddy,Nellore City Mayor Sailaja Reddy, Nellore MLC Raghavendra Reddy and many prominent TDP leaders, Kadapa Distric Ex Market committee Chairman Chennamsetty Murali Krishna, N Ramalingayya, Karthikeyan, Gurrappa, Rajesh, Dhamas, TRS leaders from Warangal Rajan, BJP leader Purushottam are among leaders who joined PRP in presence of Chiru. In a separate incident at Party Office TDP Ex Minister E Sita Ravamma, Veerapaneni YelamandRao ( EX MLA Vinukonda), K. Narsi Reddy ( EX MLA Gurajala), TPD Corporators Sheik Shawat, Tirumala Setty Prabavathi, Vuda Ex Chairman Gandhi, Ex Sarpanch from Piduguralla B Yella Rao, many Councellors from Bapatla , Other leaders joined Prajarajyam party on TuesDay Morning.